Mix the marinade ingredients together and add raw chicken strips. 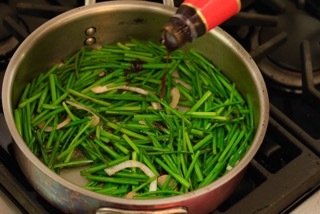 Heat 2 tablespoons of oil in wok or large frying pan until smoking hot. Add chicken and stir fry about two minutes until chicken is cooked through. 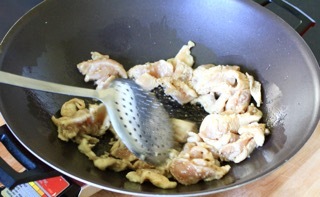 Remove the chicken and set aside in a bowl. Clean the pan and heat the remaining 2 tablespoons of oil until smoking. Add the ginger and the leeks. Add the oyster sauce and the soy sauce, while stirring constantly. Cook for two minutes and add the cooked chicken. Mix well.